Gianvito Rossi: Brought up in the business by his father, noted shoe designer Sergio Rossi, Gianvito Rossi launched his label in 2006. Kate wears the Gianvito 105 (heel height in mm, about 4.1″) and/or the Gianvito 100; a signature style for the designer. The Duchess has worn the design in bordeaux (maroon/burgundy), black suede, claret (red) suede, praline (a pale blush pink) suede. Net-a-Porter still stocks the claret, as well as the praline and black. Multi-store retailer My Theresa offers the shoe in bordeaux, in black and praline; FarFetch also carries the black. Kate added the Gianvito 85 to her collection in the summer of 2017. Kate has worn many other styles. A shoe frequently worn throughout 2011 and 2012 was LK Bennett’s Sledge in light taupe; it has also been worn by Princess Beatrice and Kate’s mother, Carole Middleton. 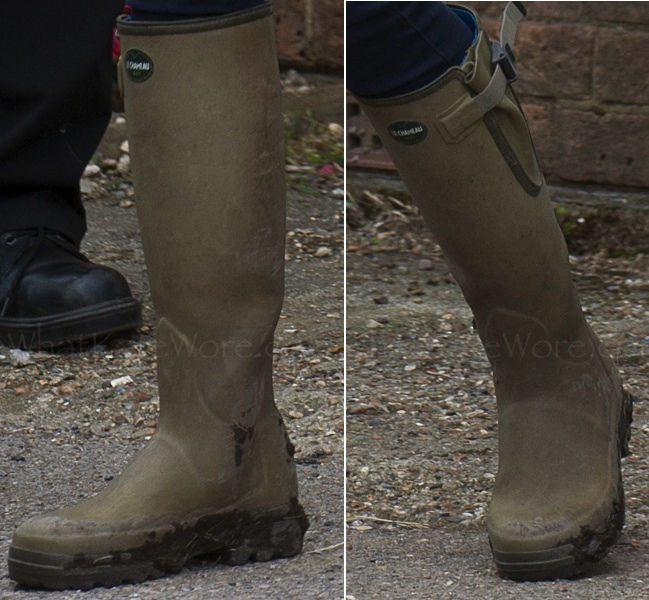 Below you see Kate on one of the many occasions she wore her Aquatalia Hi and Dry boot, aka the ‘Rhumba.’ On the right, you see the Duchess in her Aquatalia Ruby Dry booties. Prada: This remains one of Kate’s go-to brands; she has many Prada styles in her shoe wardrobe. Below left, the ‘Pointy Toe’ style in navy suede, worn to the March 2016 opening of an EACH resale shop. On the right, the Duchess wears the Prada Scalloped Wavy Strap sandal in a color called Quartz to a party at the British Ambassador’s home in Berlin. Emmy London: Founded by Emmy Scarterfield, the company specializes in bespoke bridal shoes but also offers less formal styles. Below you see the Duchess wearing the brand’s Rebecca style in the Cinder grey suede color in July 2017. Kate also wears the Valerie heels in both carbon grey and chocolate brown (she also carries the Natasha clutch in matching colors). Aquatalia: Headquartered in Montreal, Aquatalia products are made in Italy, but Kate frequently purchases them at Russell and Bromley. The company’s Facebook page is here. The Duchess frequently wears the “Rhumba” style (known in the UK as the ‘Hi & Dry’ boot); below you see her in the Rhumba for an appearance at St. Andrews. Below right, for Kate’s first formal outing with Prince William in 2011, she wore the “Rouge” booties, also known as the ‘Ruby Dry’ at Russell and Bromley. Stuart Weitzman: The Duchess has shown a fondness for this brand. One of Kate’s most-worn styles has been the Corkswoon wedge espadrille in ‘nice blue suede,’ shown below left. Below right, the ‘Minx’ cork-heeled wedge, also frequently worn, first noted in May of 2012. 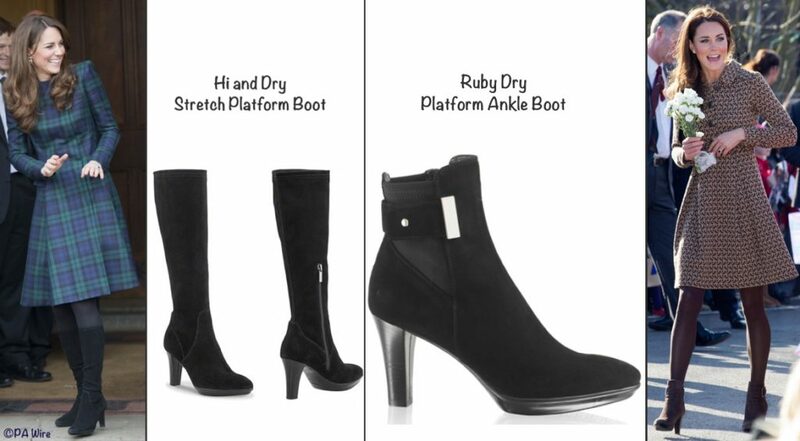 Many of the Weitzman styles Kate wears are available in the UK through Russell and Bromley, which is where the Duchess acquired the Weitzman ‘Zipkin’ and ‘Half & Half Stretch Rider’ boots. 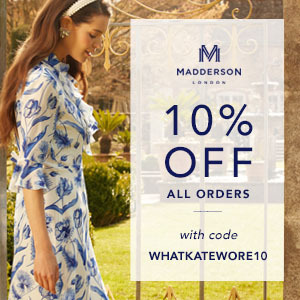 French Sole: All of the Middleton women are fond of French Sole (known as London Sole in the US), the brand is known for its elegant ballet flats. The company’s shoes are made at its own factory in Spain; it has four shops in London, just opened in Asia and plans continued expansion. The French Sole Facebook page is here; its Twitter feed is here. The London Sole Facebook page is here, and Twitter feed here. Below we see Kate in May of 2011 wearing the India (also called the Henrietta) style. Jimmy Choo: Kate has shown a growing fondness for the fashion-forward styles of Jimmy Choo Facebook page is here, its Twitter feed is here. The Duchess has worn the glittering Vamp Sandal on many occasions; it was first noted at the BAFTA Gala during the 2011 Tour. Kate also wore the Jimmy Choo Dart Sandal during the 2012 Jubilee Tour, seen below right. She is also fond of the Cosmic Platform pump. Le Chameau: This French brand’s boots have long been favorites of the country set, they are exceptionally well made, and a solid competitor to the Hunter brand. 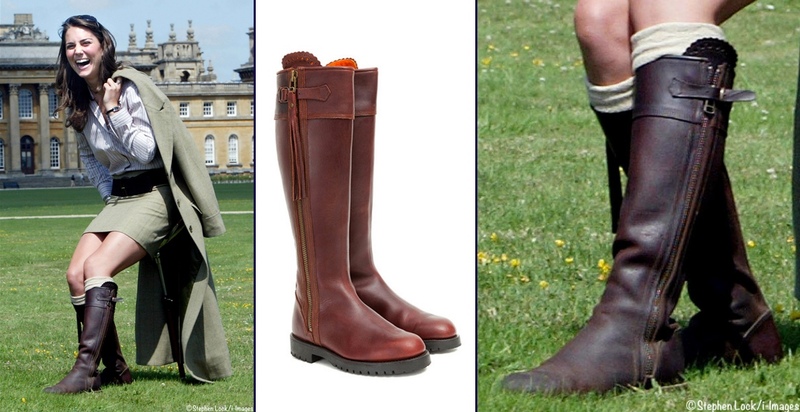 The primary Le Chameau Facebook page is here; Kate wears the brand’s Vierzonord style. Kate is seen in the Le Chameau Vierzonord (or Vierzon Nord). Penelope Chilvers: This London-based company specializes in footwear made in Spain of all natural materials, Ms. Chilvers is credited with introducing the Spanish style riding boot to the UK. The company’s Facebook page is here. Of course, the style everyone is interested in is the company’s Long Tassel Boot, shown below; it is a style the Duchess has continued to wear through 2017.